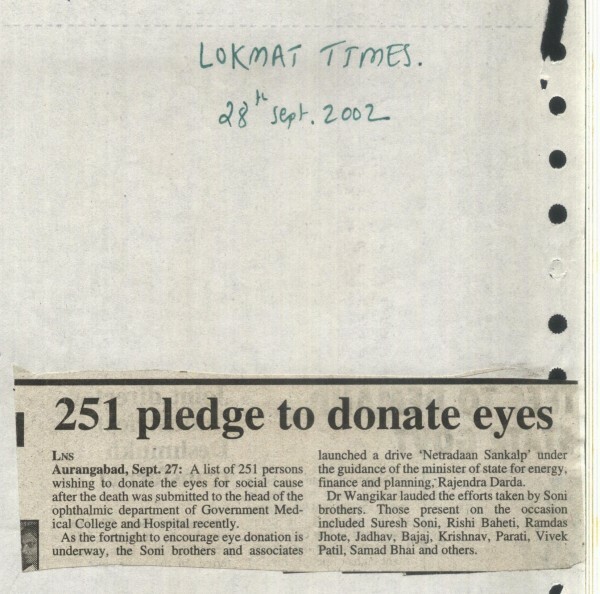 We were successful in augmentation & collection of 251 consent letters from Eye donors. Distribution of printed material with literature on Eye Donation and its importance was moved throughout the city. Here we motivated more than 35000 people by distributing 20,000 Eye donation information pamphlets. 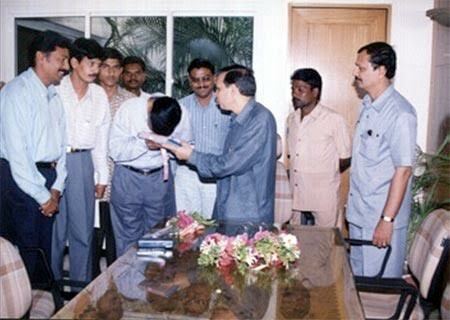 Hon.Minister Rajendraji Darda,Govt of Maharashtra ,handed over 251 Eye donation consent letter collected by kishor soni, to Govt Eye bank chief Mr.Vilas Wangikar,with Mr.Suresh soni and other members of team. 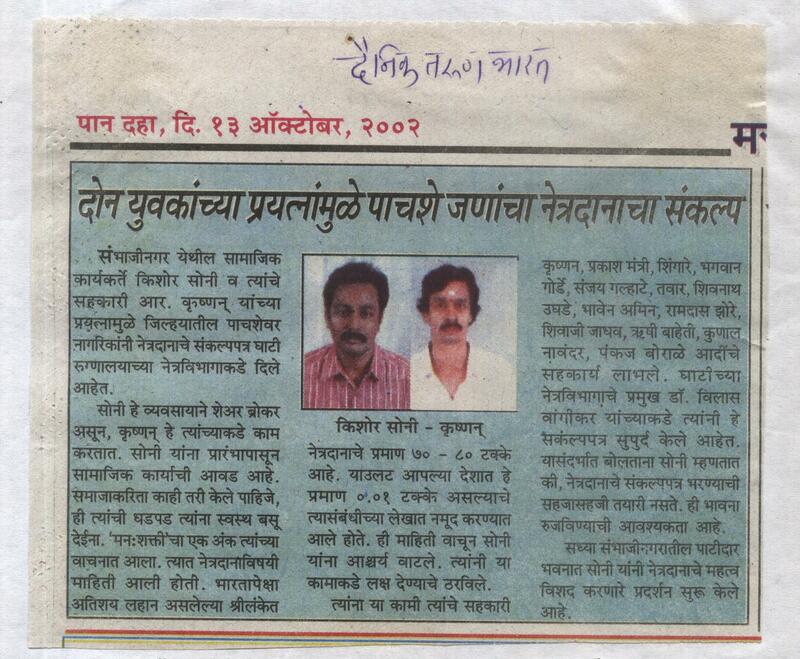 9th September,2002:News in Daily Sanjwarta:Sanjawarta newspaper publish our news in today’s paper.It impacted thousands of its readers.Thanks to Sanjwarta team. 13th September,2002: News in Daily Samna:Daily Samana publish our news in today’s paper.It impacted thousands of it readers.Thanks to Samana. 23rd September,2002:News in Daily Sakal:Daily Sakal publish our news in today’s paper.It impacted thousands of it readers.Thanks to Sakal. 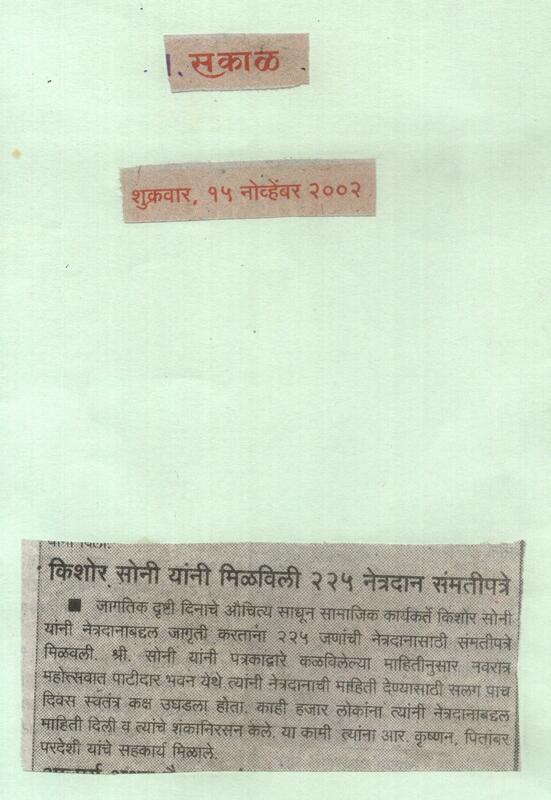 28th September,2002: News in Lokmat Times:Daily Lokmat Times publish our news in today’s paper.It impacted thousands of it readers.Thanks to Lokmat Times. For 9 days at Patidar Bhavan during Navaratri: Thousands of pamphlets educating ‘about eye donation and its value were distributed to the general public. The 9 days festival has proved successful in obtaining 500 consent letters from voluntary eye donors. Here we motivated more than 30,000 people by distributing 12,000 Eye donation informative pamphlets. Social worker Ad. 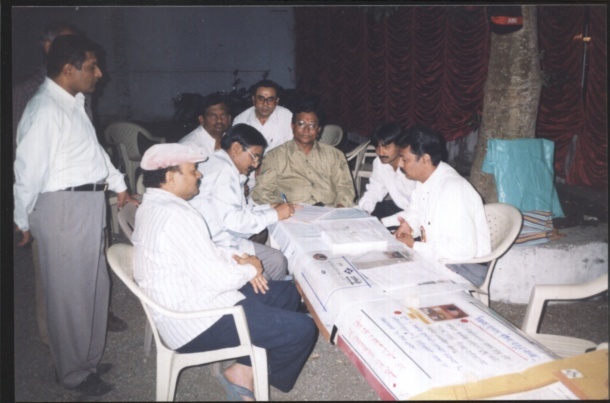 kishor soni taking sign on consent letters form people for Eye donation after death. 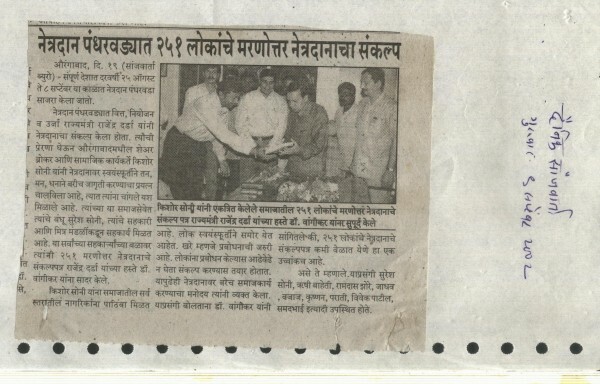 10th October,2002:News in Lokmat Times:Daily Lokmat Times publish our news in today’s paper.It impacted thousands of it readers.Thanks to Lokmat Times. 10th October,2002:Article in Sanjwarta:Today our article about eye donation,importance,who can donate eyes,who can not,etc published in daily newspaper Sanjwarta.It positively impacted on its readers. 13th October,2002:News in Daily Lokmat:Daily Lokmat publish our news in today’s paper.It impacted thousands of it readers.Thanks to Lokmat. 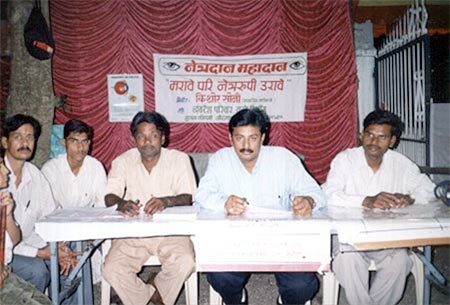 13th October,2002:Story in Tarun Bharat:Daily Tarun Bharat published our story showing our devotion towards eye donation mission.It impacted positively in masses.people motivated by this.Thanks to them. 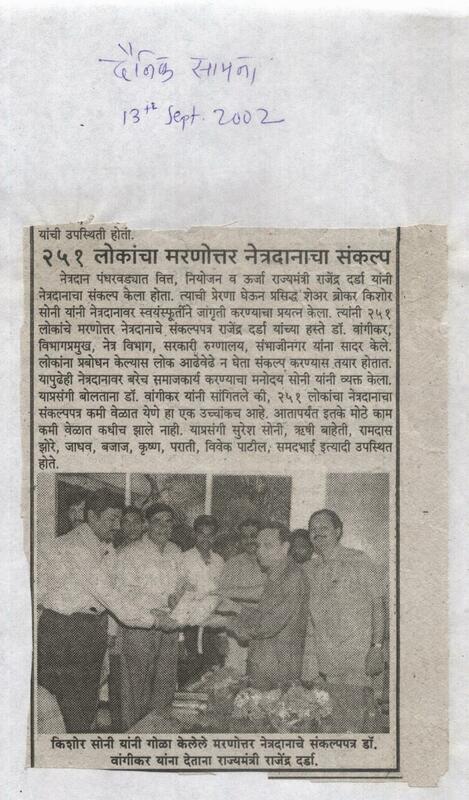 15th November,2002:News in Sakal Newspaper:Daily Sakal publish our news in today’s paper.It impacted thousands of it readers.Thanks to Sakal. 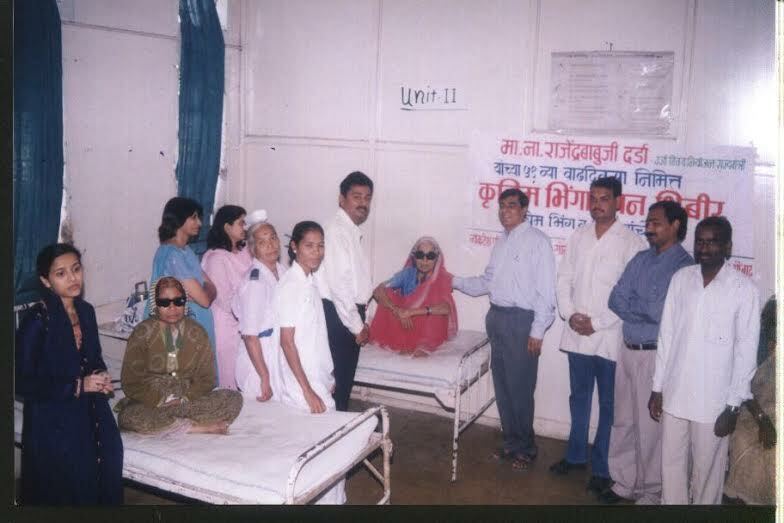 21st November,2002:Cataract operation and eye donation camp:On the occasion of 51th Birthday of Hon.Minister Rajendra babuji Darda,Vyankatesh pariwar jointly with Govt.Eye dept organised free Cataract surgery camp to needy and poor patients.Here successfully 69 cataract surgery and 69 eye donation forms fill done.Thanks to HOD Dr.Wangikar and his staff for success of this.Here we distributed free Spectacles to all patients. Jai netradan. 27thNovember,2002:News in Lokpatra Newspaper:Daily Lokpatra publish our news in today’s paper.It impacted thousands of it readers.Thanks to Lokpatra. 29thNovember,2002:News in Lokmat Samachar newspaper:Daily Lokmat Samachar publish our news in today’s paper.It impacted thousands of it readers.Thanks to Lokmat Samachar.